Tag line: "Greatest Odyssey Of The Ages - for the first time on the screen"
Ray Harryhausen, that master of stop-motion animation, is a man of unlimited patience. Take, for instance, the most famous scene in 1963s Jason and the Argonauts, where a small army of skeletons attacks Jason and his crew as they attempt to escape with the Golden Fleece. This sequence, which lasts less than five minutes, took Harryhausen four and a half months to complete, an average of roughly 2-3 seconds worth of animation per day. This is the level of dedication that Harryhausen brought to his work on a regular basis, and his commitment to his craft is on display throughout Jason and the Argonauts. The kingdom of Thessaly has been conquered by the evil Pelias (Douglas Wilmer), and, according to a prophecy handed down by the Gods, the only mortal capable of removing him from power is Jason (Todd Armstrong), the heir to Thessaly’s throne. To strengthen his position and win favor with the Gods, Jason plans an expedition to locate the Golden Fleece, a magical item that's hidden at the end of the world. To undertake this task, he orders the finest ship be built, which he names the Argo, then assembles a mighty crew to sail her, including heroes like Polydeuces (John Crawford) and Hercules (Nigel Green). 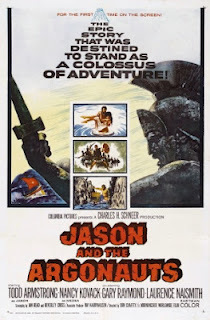 Assisted by the Goddess Hera (Honor Blackman), Jason travels the high seas, battling ferocious creatures in an attempt to prove himself worthy of what is rightfully his. Jason and the Argonauts is a tremendous fantasy film, opening with King Pelias’ conquest of Thessaly, a thrilling, well-staged battle that sets the tone for the entire movie. Also, to add some authenticity to the tale, many key scenes were shot among actual ruins including those in Paestum and Palinnuro, Italy (the attack of the harpies against the blind soothsayer, Phinneas, who’s played by Patrick Troughton, makes especially good use of these ancient locales). Take all this, then throw Ray Harryhausen’s animation in on top of it, and you’re left with one hell of a film. Along with the skeleton army and the marauding harpies, Harryhausen introduces a few other classic characters in Jason and the Argonauts, like Talos, the huge metallic statue that attacks Jason on the isle of Bronze. Even with its grand spectacle and impressive sets, Jason and the Argonauts is proof positive that Ray Harryhausen takes a back seat to no one! My father took me to see this at the Interboro Theater on Tremont Avenue in the Bronx. Harryhuasen's fighting skeletons scared the crap out of me (I was 7 at the time). The Golden Fleece, on the other hand, had a calming effect. Thanks for the comments, guys, and sorry for the late reply! @Robert: I love it, too, and thanks for sharing your link to your review. I enjoy reading your take on movies. This is one that we definitely agree on Doc! I adore this movie, in fact it's probably up there in my top 20 of all time. It was a staple of rainy Sunday afternoons watching TV with my dad when I was little and I distinctly remember being mesmerised by the variety of imaginative creatures and creations on display. I can say with all sincerity that I think Harryhausens work here holds up and looks superior to today's CGI equivalent. Sure CGI may be much more slick and versatile but to me these older effects have a weight and character all of their own. I think my mind finds it easier to accept these objects because they subconsciously register as actual physical elements while to me computer graphics, unless done with great talent and subtlety, always betray their lack of physicality and thus break my suspension of disbelief. Harryhausen's creatures were directly crafted and choreographed by human hands and to me that fact communicates a sense of charm and organic personality that is nearly impossible to replicate through a computer interface. I find it truly sad that stop motion animation seems to be a dying art. I’d love to see some modern monster movies implement it as I think its creaky otherworldliness could lend a great atmosphere to low budget horror.